Christmas Special. Fletcher discovers that his fellow inmates are planning to escape. Norman Stanley Fletcher is sentenced to 5 years at her Majesty's pleasure at HM prison Slade in darkest Cumbria. His naive cell mate Lenny Godber needs to learn the ropes, skives and scams and evil prison officer Mr.Mackay tries to run the prison his own way. And then there's Mr.Barroclough who is just too weak willed to have his good nature exploited. Warren: I've got this letter, like. Fletch: From a woman, it looks like, and, judging by the handwriting and stationery, a woman of low standards. Warren: That's right! It's from the wife! Q: Does Ronnie do the voice of the judge at the beginning? Q: What is a rilk? 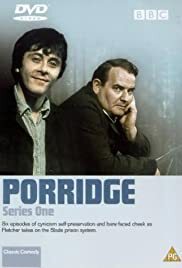 This is easily the funniest comedy ever made.The characters are very strong - Mackay the harsh scottish guard with his neck 'twitch', Barrowclough the well-meaning and gullible guard, bumbling around pathetically, Godber the innocent and naive prisoner, and of course Norman Stanley Fletcher. Ronnie Barker's acting is superb - his expressions and timing are perfect.